On Saturday morning my sister and I met at Second Home Nature Center for a hike with our boys. We got off to a somewhat rocky start (car sick barfing in the parking lot) and had a few rough patches as is bound to happen with toddlers (and kids in general), but it was still worth the effort of course. I was too chilled (even with polypro top and bottom) to attempt much photography, plus the lighting was not ideal for my old cell phone, so these pics are courtesy of my sister. 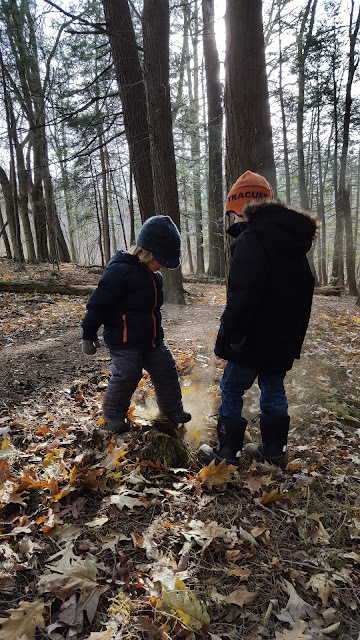 There was rock and stick throwing, playing in the leaves, and some vigorous stomping of puff balls, in addition to running and rolling around. The boys are rather fond of each other, despite the age difference. What fun! Wish I could be there.